The president of BCC-Grupo Cooperativo Cajamar, Luis Rodríguez, and the president of Spain's Official Institute of Credit (ICO), Pablo Zalba, have signed an agreement to launch the "ICO Credit Facilities 2017”, offering loans to small and medium enterprises and self-employed professionals under advantageous conditions. 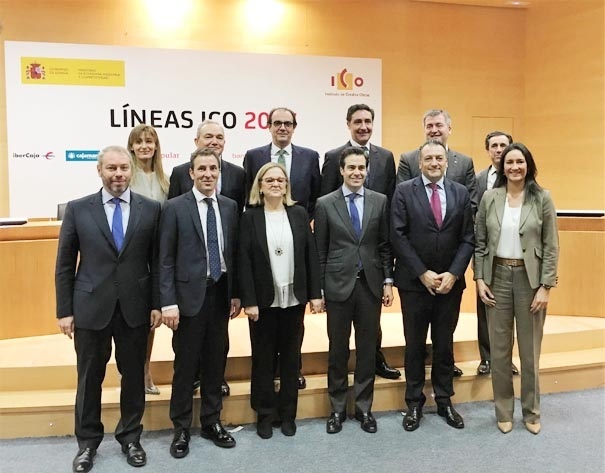 The presentation of these new credit facilities was attended by the Secretary of State for Economics and Business Support, Irene Garrido, and representatives of a further nine financial entities. Grupo Cajamar was one of the ten most active financial entities in the concession of ICO loans in 2016, demonstrating its support for small and medium enterprises, as well as self-employed professionals. The president of BCC stated that Grupo Cooperativo Cajamar "is making necessary resources available to Spanish businesses so that they can grow and develop their activities in Spain and abroad. And to this end, we are reinforcing the products and services offered through agreements reached with leading public and private institutions. The ICO Credit Facilities 2017, offered by Grupo Cooperativo Cajamar with a view to helping make Spanish businesses more competitive, and which will be available until 15 December 2017, are divided into two major strategic areas of activity: “ICO Businesses and Entrepreneurs 2017” and “ICO International 2017”. Through the "ICO Credit Facility for Businesses and Entrepreneurs 2017”, the Group's customers will gain access to financial resources that will enable them to take on investment projects and to meet their needs, securing up to 100% of their investment requirements repayable over 20 years, with up to two years' grace period. And if they are looking to finance up to 100% liquidity, they will have up to four years to repay the loan with an optional one-year grace period, provided they do not exceed the maximum finance available per customer of 12.5 million euros, over one or several operations. The "ICO International Credit Facility 2017”, offered by Grupo Cajamar, on the other hand, can be used to finance investment and liquidity up to a maximum per customer of 12.5 million euros, and is available to self-employed professionals, Spanish businesses and public and private entities, domiciled in Spain or abroad with at least 30% Spanish capital, with repayment terms of up to 20 years for 100% investment and up to two years' grace period, and 100% finance for liquidity repayable over 4 years with an optional one-year grace period. These finance facilities are also open to medium and long-term exporters. In the photo: Group photo from the presentation of the ICO Finance Facilities 2017.